Decorative Life: Can last 8-14 days and in some cases even longer (up to 26 days). Can be harvested in the bud stage when only the outer petals were colored or later when the outer petals were fully opened but the stamens were not yet unfurled. ‘Giant Hybrids’ can be harvested more open and still last about 10 days. Member of the not so common Dipsacaceae (teasel family). Native to the Caucasus Mountains. 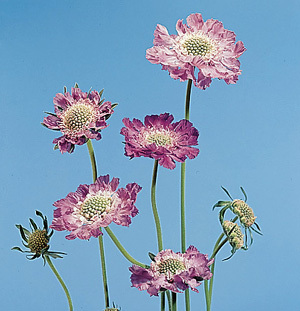 Relatives include Cephalaria, Knautia, Morina and Succisa. Flower heads are about 2 inches across with outer whorl of petals and center of less conspicuous flowers. Stems are thin, 20-28 inches long. Plant is a herbaceous perennial, classed as a dicotyledon. From the Latin “scabies” (itch), the plant’s rough leaves were said to cure an itch. The specific epithet name “caucasica” means of the Caucasus Mountain region, between the Black and Caspian Seas. At first glance this species looks like a member of the Compositae or aster family. Don’t be fooled by the delicate appearance of the flowers and stems as flowers harvested fully open still can last for about 10-12 days.